Next: Cookies n Cream Cupcakes! 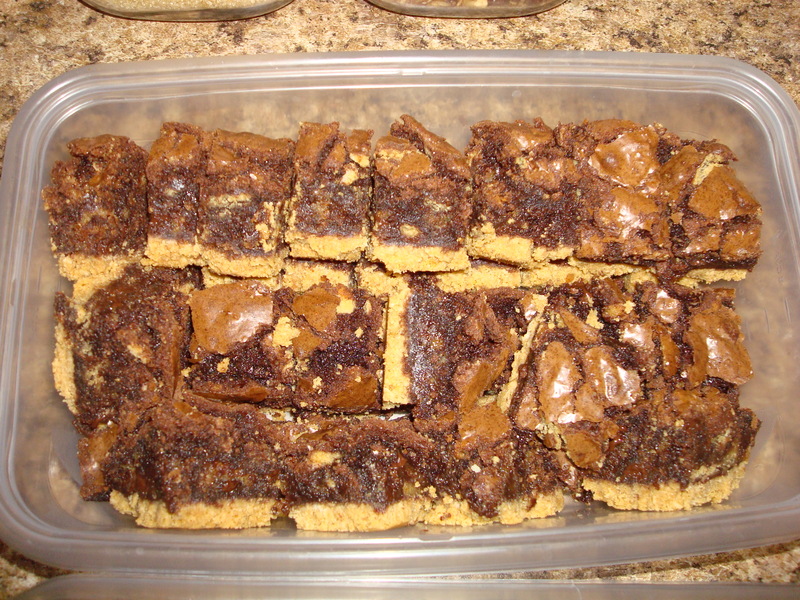 Brownies with Blondie Chunks and Golden Oreo Crust! Lifts easily out of the pan because of the foil! Ready to bring to the office! What to take your brownies up a notch? Don’t get me wrong, these “regular” brownies are my favorite “more traditional” dessert of all time. BUT, if you’re looking for something new. something unique. something with multiple layers and flavors, you’s gotta try these. 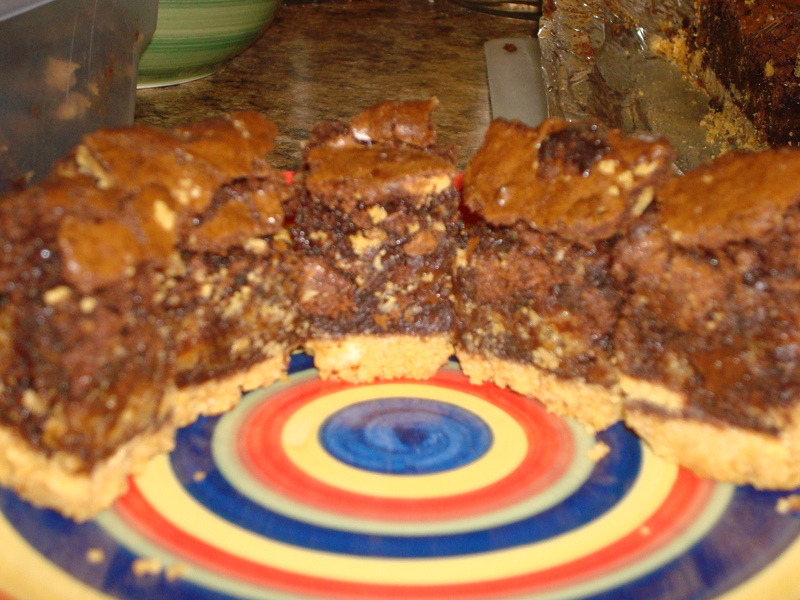 These are my fudgey brownies, atop a golden Oreo crust, with chocolate chip blondie chunks and golden Oreo pieces mixed in. I made them for a wonderful friend’s going away party– she loves golden Oreos. The blondie chunks were a actually from a mistake. I had made them the day before, and underbaked them juuust a littttle bit too much. What to do? Mix them into another dessert and bake! Perfect. It’s a great balance– super chocolatey brownie, but also a vanilla-y crust! And the blondie pieces of course. There are multiple steps, but trust me, it’s worth it. 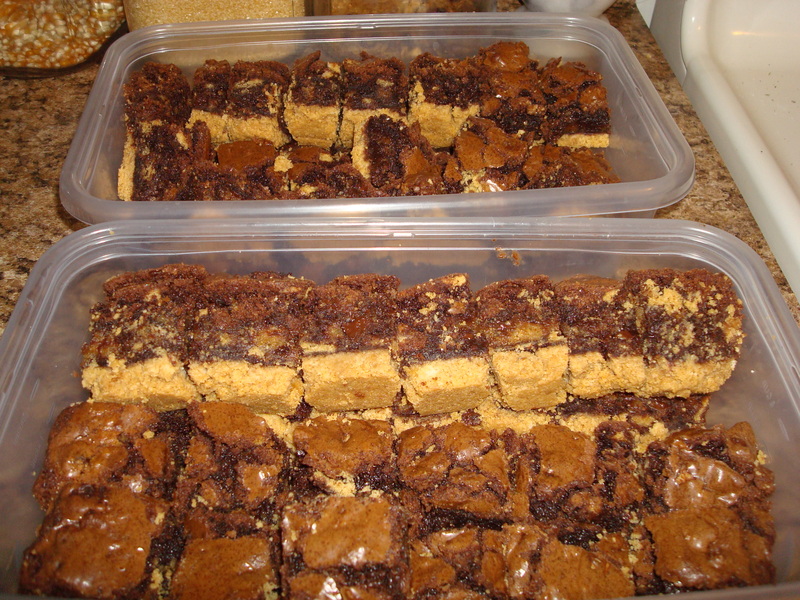 You can even make the blondies the day before and then make the brownies and assemble the next day. 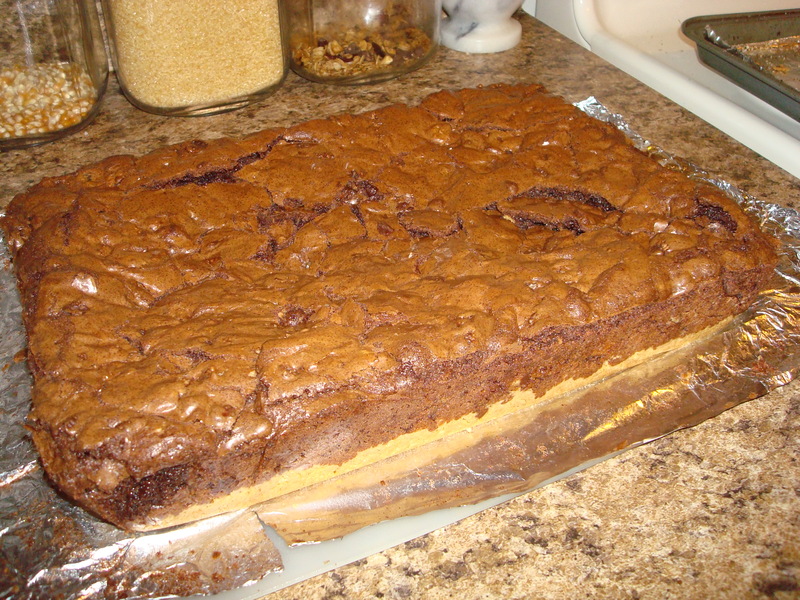 Brownies with Blondie Chunks & a Golden Oreo Crust! 1) Preheat the oven to 375 degrees F. Line a 13 x 9 inch baking pan foil and spray with baking spray. Set aside. 2) Pulverize the box of sandwich cookies in a food processor or blender. Put them into a bowl and mix with the melted butter. Keep mixing until evenly distributed. Press the crust into the bottom of the pan. Bake in the preheated oven for 5 minutes. Then remove from the oven. 3) Line a 15 x 10 inch jelly roll pan with foil and spray with baking spray. 4) In a medium-sized bowl, whisk together the flour, baking powder, and salt. Set aside. 5) In a large bowl, combine the melted butter and the brown sugar. Whisk together well, until the brown sugar is dissolved into the butter. 6) Now, beat in the 3 eggs and the vanilla. After that, switch to a spatula. 7) Slowly incorporate the flour mixture into the butter mixture. Stir in the chocolate chips. 8) Pour the batter into the prepared pan. Bake for about 15 minutes.  NOTE it will be undercooked! That’ what you want. Place on a wire rack to cool. Turn the oven down to 325. 9) In a small bowl, sift together the flour, baking powder, baking soda, cocoa powder, and salt. Set aside. 10) In a large bowl, whisk together the melted butter and the sugar. Whisk well until all of the sugar is fully dissolved. Add in the eggs and vanilla, beating well. Now, switch to a spatula. 11) Slowly incorporate the flour mixture into the butter mixture. Fold in the crushed golden oreos. 12) Break/crumble up the blondies (they wont really crumble, because they’re gooey and underbaked, but you want to break them into little pieces as best you can). 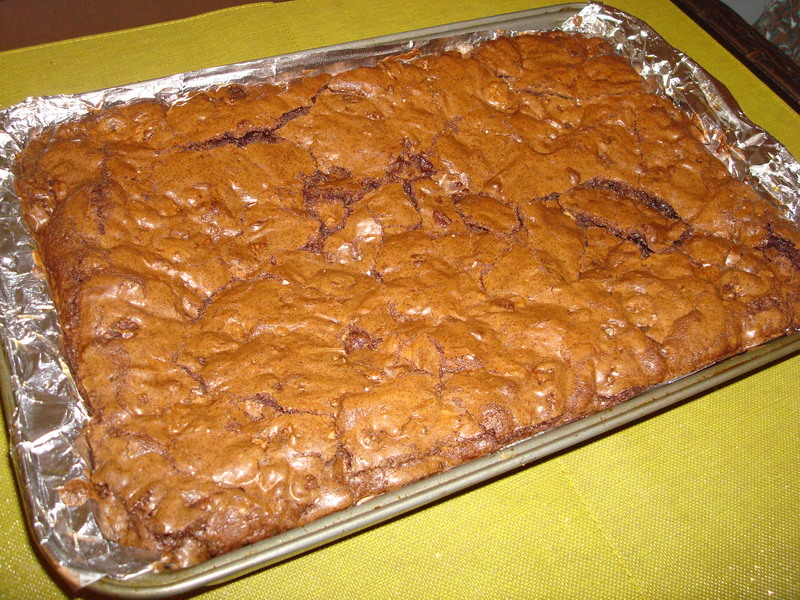 13) Spread half of the brownie mixture over the crust in the 13×9 inch pan. 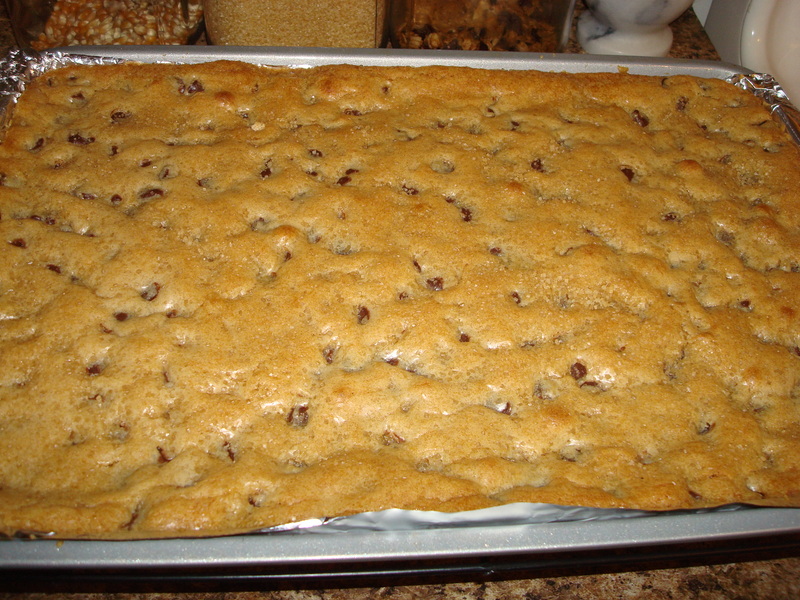 Now, evenly distrubute the blondie chunks over the batter. Top with the rest of the brownie batter. 14) Bake in the oven for about an hour. I toothpick inserted in the center will not come out clean, because these are fudgy brownies. So, you have to use your judgement. 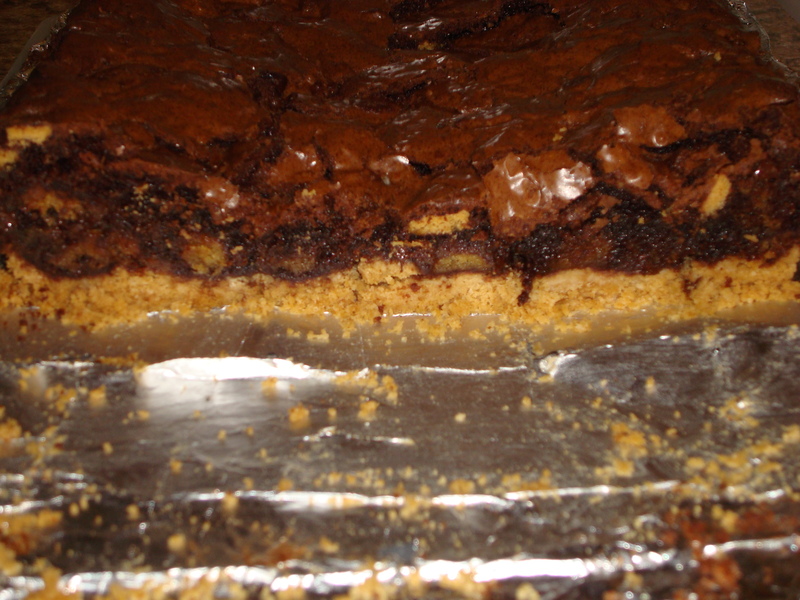 It the brownies are pulling away from the sides a bit, and the center looks set, it’s done. 15) Cool on a wire rack. Then, use the foil to lift the bars out of the pan. The cut them, and eat!